Doug subdivided the book into 8 chapters, paralleling the typical sales process. These chapters contain 116 segments, which are laser-beam topics of 2-3 pages each, perfect for weekly sales coaching sessions, especially when coupled with the Leader Guide. Each segment begins with a brief yarn, story, or tale; introducing the specific coaching nuggets. Subdivided this way, busy salespeople will not have to devote lots of reading time at any one setting. Enthusing – Attaining and maintaining upbeat outlook, point of view, and attitude. Essentializing – Basic selling traits and principles necessary for success. Engaging – Prospecting principles and agenda development to initiate a sales conversation. Exploring – Probing and questioning to uncover the pain, needs, and desires of prospects. Elaborating – Presenting your solution as the antidote to the pain you uncovered. Encountering – Determining and resolving buyer concerns and objections. Executing – Reaching agreement on logical next steps leading to closing. Expanding – Ongoing collateral activities to grow your business and ensure sales success. Below are several free to preview excerpts from the book. IMPORTANT: PayPal is our payment processor regardless of your payment method. When you click the BUY NOW button, it will automatically take you there. ALL US SHIPPING IS FREE! "Doug’s book is a confidence booster and gives practical ways to increase your numbers. Simple methods, when applied, not only increase your sales but make you an all-around better person. The author does not $ell himself short. 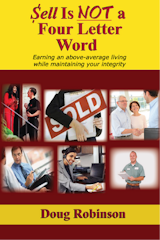 He shows you how to keep your integrity and make lots of money in the process." "Great book, easy read. I love the stories and would recommend to anyone that works in sales or is thinking about a career in sales." "Awesome book and a great read! I really like the stories that help back up the points." "It is something that will help me with my team in the sales room. It is very practical and easy to read and comprehend." 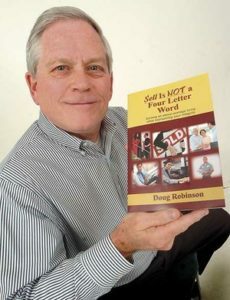 "Doug Robinson exudes a rare blend of wisdom, insight, and energy. His sales training nuggets are concise, clear, and compelling." "Your book and leadership have been invaluable to all of us. Keep up the GREAT work. Congrats on the media recognition coming your way." "Thanks for all you do! It continues to be helpful to sharpen the skills needed to be consistent in this arena! Dude you Rock!" "It’s not often that kudos go out to the man that improves our sales success, but I want to say congratulations and THANK YOU!" Paul Tomlinson, Region Manager, Paducah, KY.
"About halfway through the book and I have written several orders that I probably would have lost if I wasn't sharpening my skills using your book. It has really helped me clean some of the cobwebs out of the attic."